The Nagel Vollenda is a lovely little folder that uses hard to find 127 rollfilm. A very nice little folder, no bigger than a pack of cigarettes when folded. 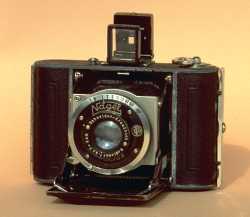 Made from 1929 to 1937, the Nagel Vollenda has a rather good reputation. It was fitted out with various lenses and shutters. The one on the picture has a Schneider-Kreuznach Radionar lens and a Compur shutter. Some were fitted out with the very good Schneider-Kreuznach Xenar and Leitz Elmar lenses. It has an albada viewfinder and no rangefinder. It uses hard to find 127 rollfilm.